Control 10,14,20,28,40,48 ,ditigal I/O points. Program memory size upto 2K Words. Built-in back up flash memory. Built-in HSC , pulse output ( for TR output module only). Basic control to 28,48 points and upto 104 digital I/O points. Expansion upto two moduleseach of 28 points. Two serial ports ( 2RS232C / RS485 with modbus RTU ) . Program memory size upto 9K words. Built-in HSC , pulse catch , pulse output ( for TR output module). Built in real-time clock, PID functions . High speed basic instructions- performance- 0.2micro/ step. 2. Control upto 384 digital I/O points. The 12-slots LX70 allows upto 384points ( 192 points using terminal blocks ). 3. Various I/O types and specialty modules. Digital Out : relay transistor ( 16 points, 32 points), SSR, Combo I/O. SCU (2 ch serial Datacomm) and link network. 4. Range of I/O base options (upto 12-slots). When configuring a system, PLC LX series enables you to choose a backplane from 2,3,5,6,8,10 and 12slots. 5. High capacity programming and memory backup option. (For LX70-CPU70P2). Built-in flash EEPROM retains all ladder logic. Supports 8-loop PID controls (Only for LX70-CPU70P2 module). ( Only for LX70-CPU70P2 module ). 8. Built in RS232C and RS 485 2 ports (LX70-CPU70P2 module ). Interface modern and controllers to exchane large volume of data with high speed. 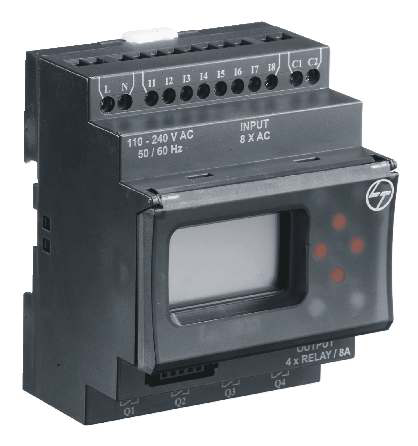 Readers, inverters, modbus slave or servos. (Binary communications available). Self-diagnostics to minimize system errors and to maximize diognostics efficiency. 10. LX Soft programming software. LX Soft programming software lets you create , modify CPU,forced I/O, I/O configurations . It is a power-ful, easy to use tool for program uploaded / downloaded. 12.28 Basic and 147 advanced instructions. The LX700 series give you the capability to control a medium scale system with ease. With it's remote I/O and various networking configurations, it is best suited for applications combiming multiple devices spread over a large installations. Fast, powerful processors. High-speed basics instructions executions - 0.2 micro-sec. Program memory of 20k with built-in flash EEPROM backup.Data memory of7k. Built-in PID control. 1. Control upto 1600 Digital I/O points. 3. Range of I/O base options ( from 3 to 12 slots ). 7. Serial Commmunication Unit (SCU) comes with 2 serial ports for additional Communication requirements. 8. 2 Serial ports ( RS232C/RS485 with modbus RTU/ user defined protocol) with Baud rate upto 38400bps.